The Urban Native Youth Association (UNYA) has transformed the lives of thousands of indigenous youth in Canada. UNYA currently provides programming to 6,000 indigenous youth annually and is operating out of a small space in East Vancouver. Since 2004 the association has been working on establishing the Native Youth Centre (NYC) a purpose-built, indigenous youth-led center. It will provide up to 13,000 indigenous youth with programs, resources, and tools that aim to shape their own future. These services will provide them with leadership opportunities and a spirit of independence. The current website of UNYA has served its purpose well for the last 30 years. It is no longer reflective of the thoughtful and dynamic staff and youth that make UNYA a home away from home for so many. 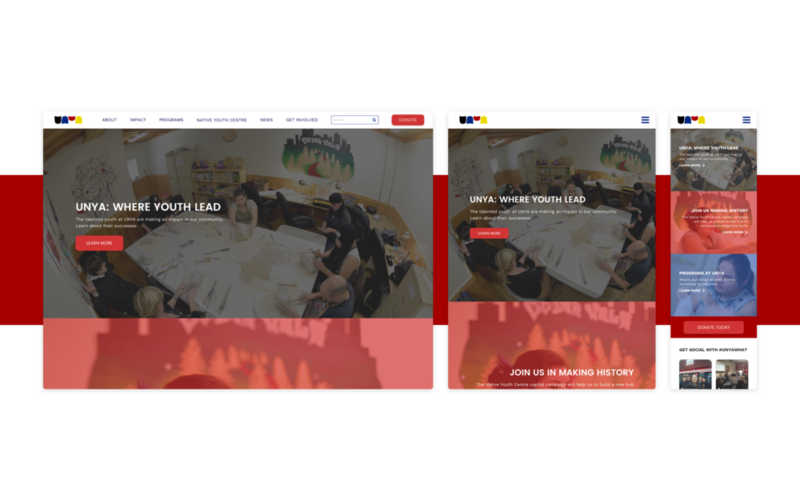 The organization wanted to rebrand both their website and their current overall brand to raise the profile of UNYA and attract attention to their multimillion dollar capital campaign for the Native Youth Center. We created a comprehensive digital brand identity that would evoke a sense of belonging while fostering independence in a culturally responsive environment. Through in-depth user research, we designed a responsive website that features a new modern and bold visual identity. The redesigned logo and comprehensive color system establish a visual language that can be easily applied across UNYA's services. While working for an indigenous organization, our team aimed to avoid appropriations and misuse of symbols and colors. From a UI aspect, we wanted to prevent any whitewashing of the brand and connection to its indigenous roots. In collaboration with our clients, we created contemporary designs that respectfully portray cultural heritage. As part of the community project programs at RED Academy, the finished prototype has been handed-off to the web development team. Both the desktop and mobile versions of the site have been successfully developed and launched. Furthermore, we provided the client with a style guide to ensure brand consistency.